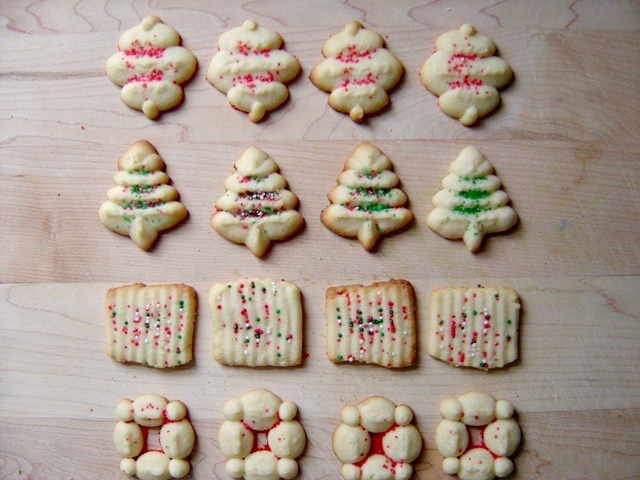 Spritz Cookies: These classic butter cookies will give any holiday cookie platter an instant boost of nostalgia. Although this is a little late, I couldn’t resist not posting about these cookies. I received a cookie press (or cookie gun as I’ve always referred to it) from my Secret Santa from my cooking website this year – the BEST gift I could have asked for!! I can’t tell you how many times I had to restrain myself from buying myself one with those oh-so-tempting 50% off coupons Michael’s was offering before Christmas. But I resisted, hoping that I would receive one for Christmas. I totally didn’t expect that it would come before Christmas so you could imagine my excitement when I opened up the box and I realized that I could make the cookies and add them to my Christmas goodie packages. I proceeded to make them the next morning and sacrificed an hour of my work day because of it. So sad about that, let me tell you. Anywho! I had a blast making these spritz cookies! The cookie gun was a dream to work with and I was so pleased with the results; with both the taste of the cookies and how the shapes turned out. I’ll definitely be using this little toy again and I’m going to look into what other recipes I can use it for. As a kid, these were some of my very favorite cookies to make with my mom. I distinctly remember pumping out large batches of spritz cookies and having an absolute blast with my brother as we sprinkled the heck out of the shaped dough. I’m so thrilled to have found a cookie press that works so well and can’t wait to use it with my little one(s) in the future. And I definitely know a few people would love to join our little future cookie squad! As much as you think the baking sheets should be lined with parchment paper, as almost all cookie recipes call for these days, do not line them for this recipe. You need a sticky base to press this dough onto and greasing/buttering the baking sheets will provide this. Thoroughly cream butter and sugar. Add egg, milk, vanilla and orange extract; beat well. Stir together flour and baking powder; gradually add to creamed mixture, mixing to make a smooth dough. Do not chill. 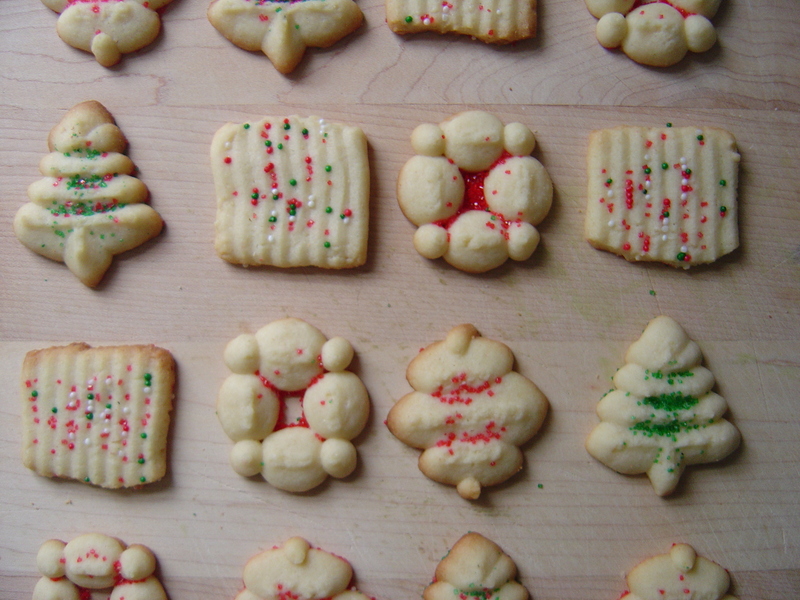 Place dough into cookie press and press cookies onto greased baking sheets. Sprinkle to your hearts desire! Bake 10-12 minutes or until lightly browned around edges. 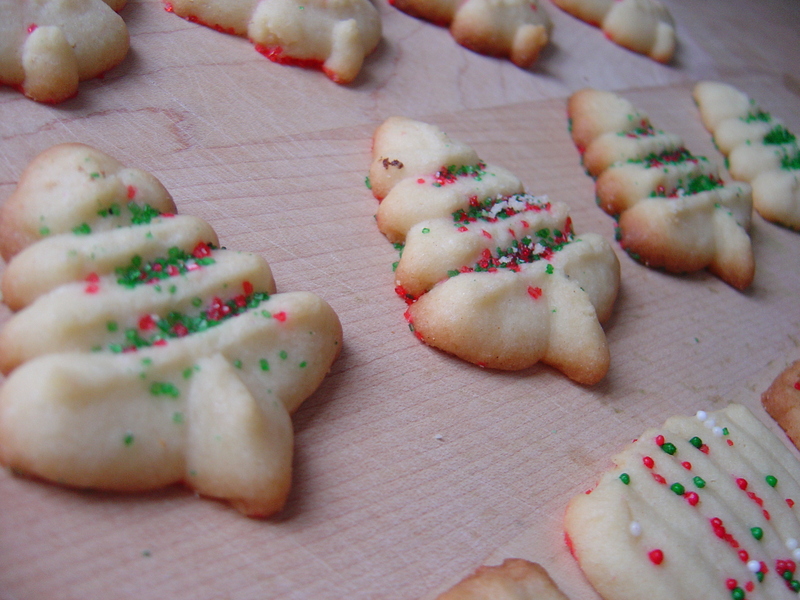 Remove cookies from baking sheets and cool completely on a cooling rack. I remember making these with my babysitter growing up. She had the cookie gun. A cookie press DOES sound like the best gift ever. I can see myself having months of fun with one! How adorable! Looks like great spritz cookies and I shouldn’t have sold mine spritzer awhile back. Hopefully I’ll make it next year!